Urban Wildlife Management Adams Clark E.
Add to cart the livre of Adams Clark E.
Urban development is one of the leading worldwide threats to conserving biodiversity. In the near future, wildlife management in urban landscapes will be a prominent issue for wildlife professionals. This new edition of Urban Wildlife Management continues the work of its predecessors by providing a comprehensive examination of the issues that increase the need for urban wildlife management, exploring the changing dynamics of the field while giving historical perspectives and looking at current trends and future directions. The book examines a range of topics on human interactions with wildlife in urbanized environments. It focuses not only on ecological matters but also on political, economic, and societal issues that must be addressed for successful management planning. This edition features an entirely new section on urban wildlife species, including chapters on urban communities, herpetofauna, birds, ungulates, mammals, carnivores, and feral and introduced species. Each chapter opens with a set of key concepts which are then examined in the following discussions. Suggested learning experiences to enhance knowledge conclude each chapter. The species profiles cover not only data about the animal concerned but also detail significant current management issues related to the species. 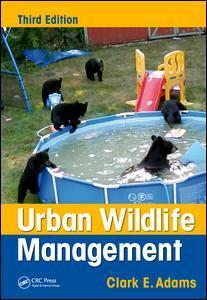 An updated and expanded teaching tool, Urban Wildlife Management, Third Edition identifies the challenges and opportunities facing wildlife in urban communities as well as factors that promote or threaten their presence. It gives both students and professionals a solid grounding in the required fundamental ecological principles for understanding the effects of human-made environments on wildlife. This book is intended for undergraduate and graduate students in wildlife conservation / management, urban ecology, natural resource management, forestry, etc. It also would be useful to wildlife and conservation biologists, wildlife managers, forestry professionals, urban planners, ecologists and NGOs such as environmental consulting firms, wildlife control companies, etc. Additionally, it would be helpful to natural resource professionals employed by government agencies and to animal behaviorists, herpetologists, ornithologists, mammalogists and zoologists.